Organization: Two team of 6 including GK&apos;s plus 2 neutral players/ Field dimension- 65x40m One goal at each end. 2 neutral players are always on the team in possession. 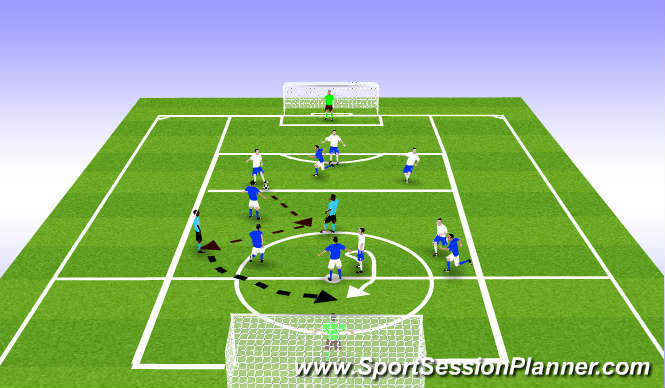 Description: 1) This game is designed to allow players in possession of the ball increased passing options in a competitve situation. This is accomplished by establishing an environment where there are always extra players to which the player on the ball can pass. Normal rules of soccer apply with the exception that the game must be restarted with "kick-ins" when the ball goes out of play. Switch neutral players every 5 minutes. 2) Progression: For the last 5-10 minutes limit the neutral players to a maximum of 2 touches each time they gain possession.